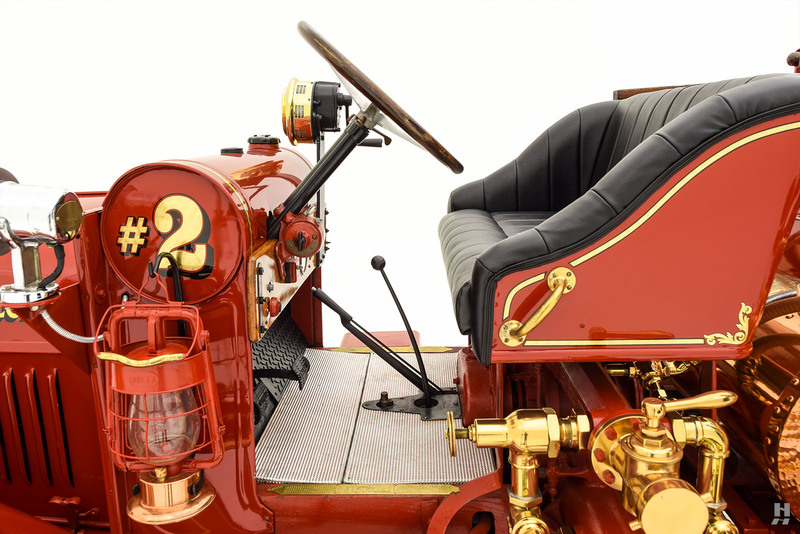 Popular culture usually credits Henry Ford as the father of the mass-produced automobile. 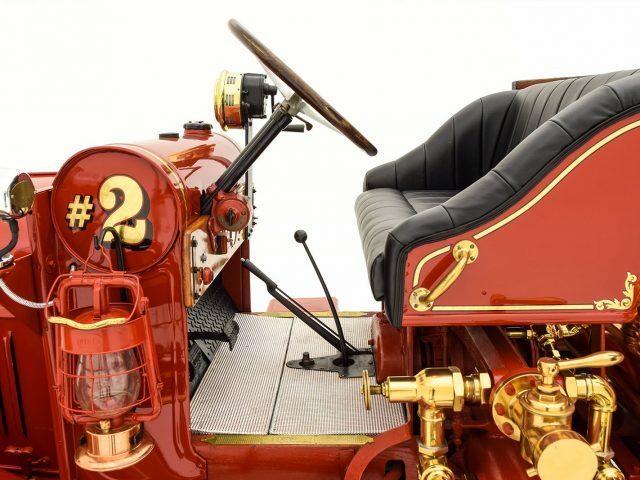 This statement is only partially true, as his Model T and moving assembly line would not have been possible without the foundational elements laid by his colleagues in the burgeoning automobile industry. 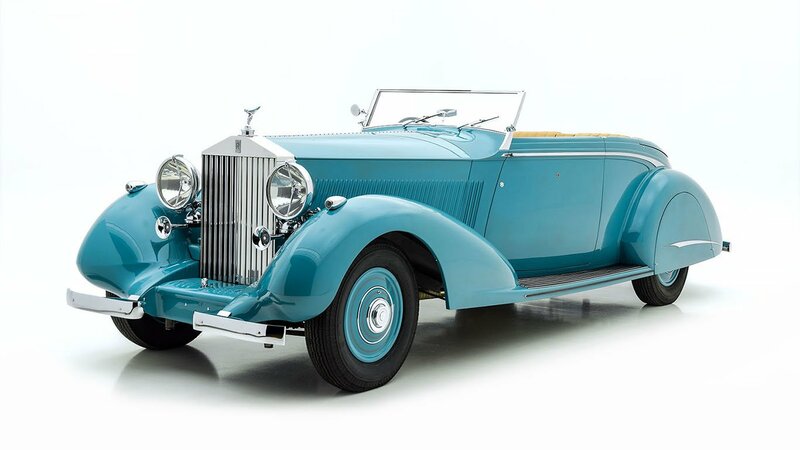 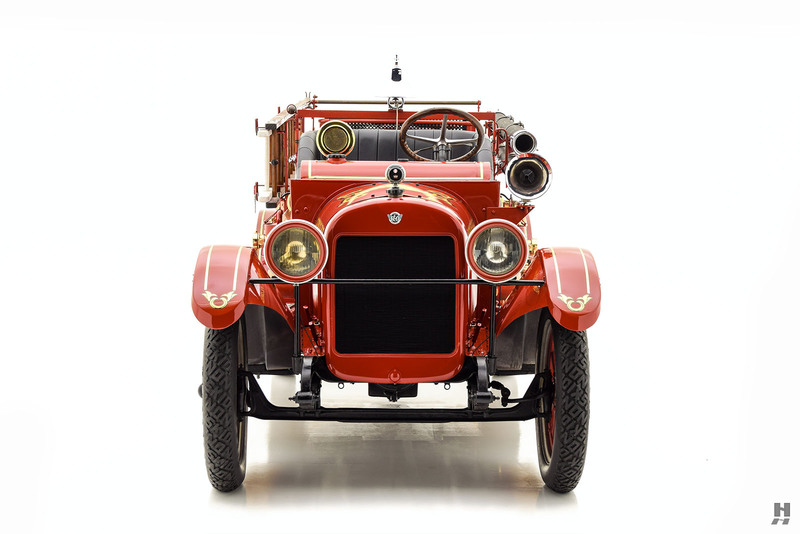 Ransom Eli Olds is among the most important characters in the development of the mass-produced motorcar. 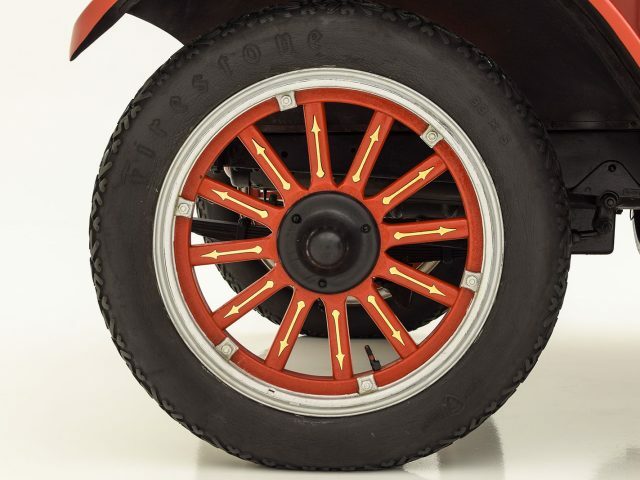 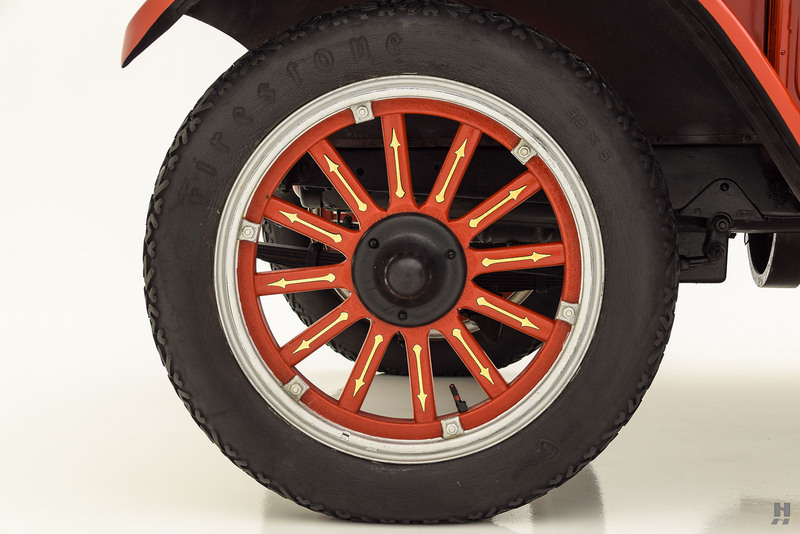 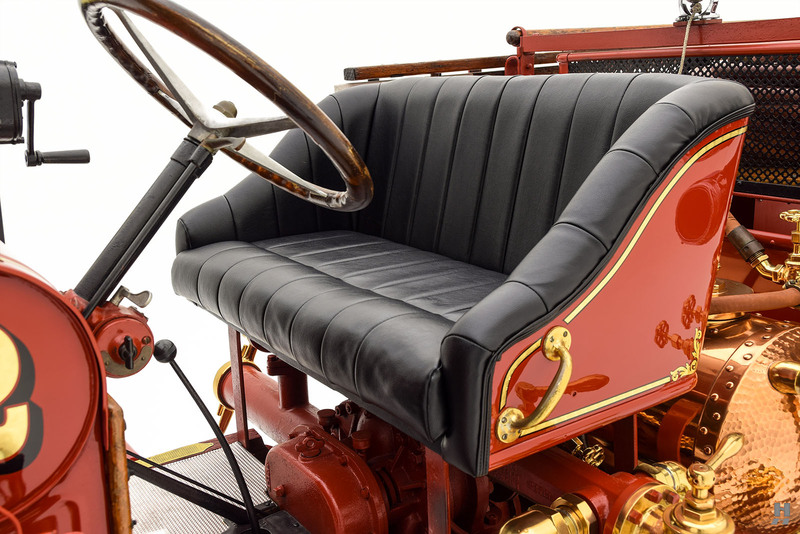 Thanks to the use of interchangeable parts and the stationary assembly line, his Curved Dash Oldsmobile is the first true mass-produced car in America. 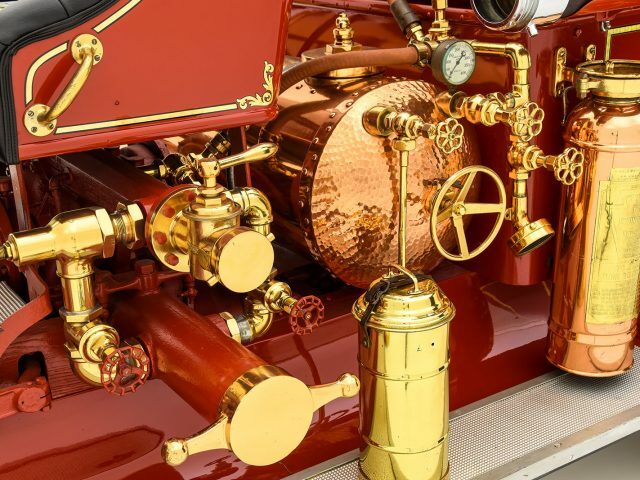 With Henry Leland of Leland & Faulconer Engineering acting as a consultant, Olds applied the concept of parts standardization which Leland first observed in the firearms industry. 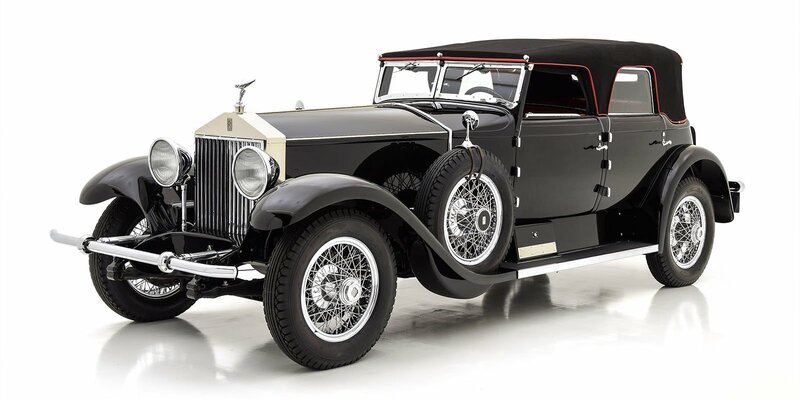 The ability to build cars quickly and cheaply allowed Olds Motor Works to become, albeit briefly, America’s top-selling car manufacturer. 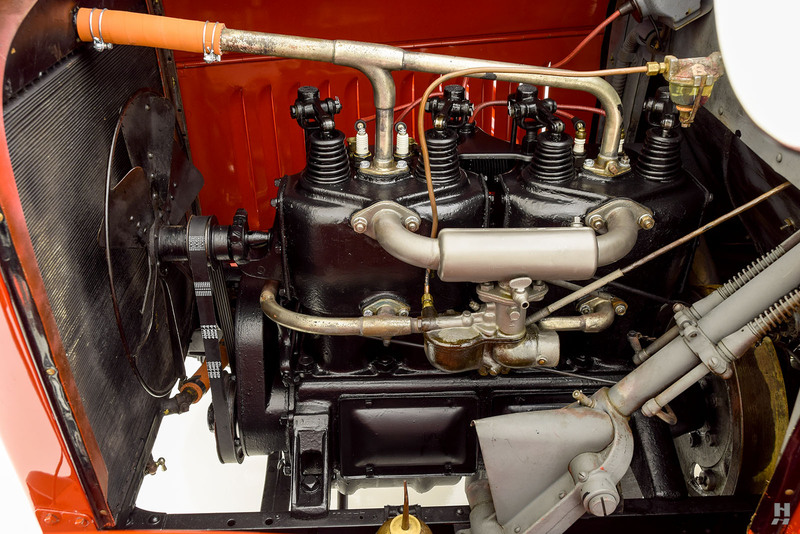 As Olds Motor Works grew, so did a rift between management and Ransom Olds over the future direction of the company. 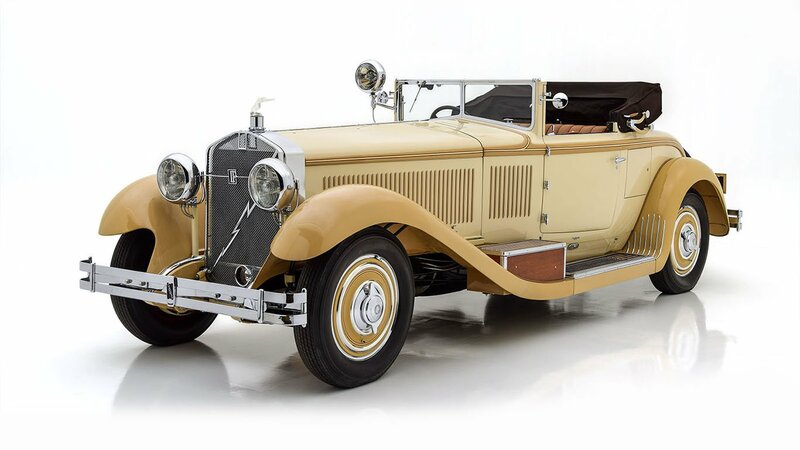 Olds wanted to continue with low-cost automobiles, while his bosses wanted larger, more luxurious cars. 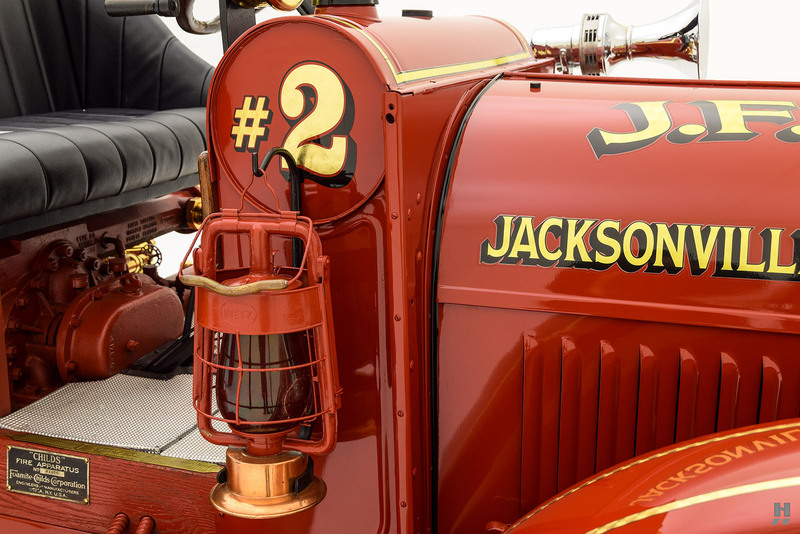 Olds lost the battle, and control over the company that bore his name. 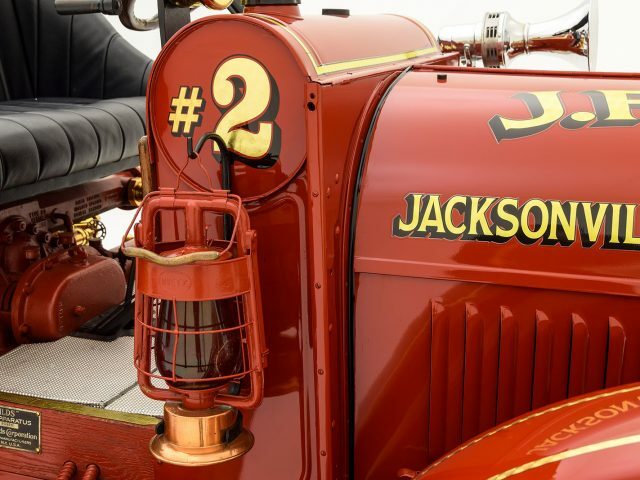 In 1904, he departed and set up a new company called R.E. 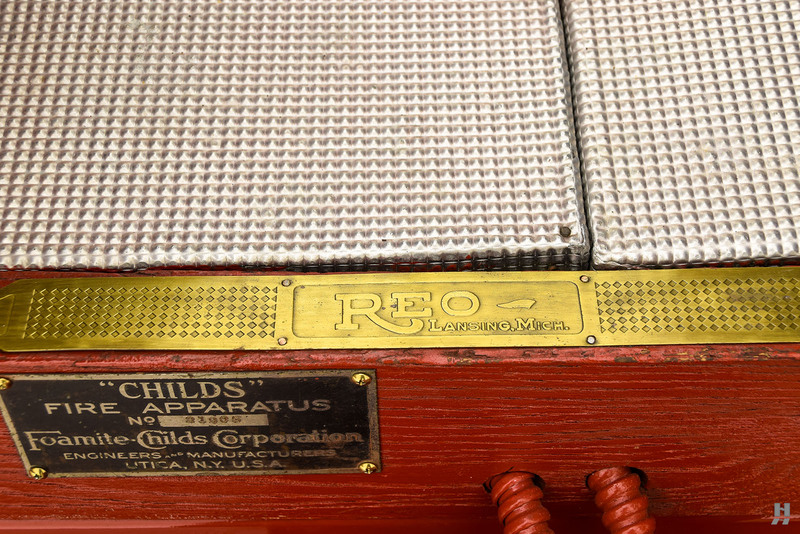 Olds, Co. 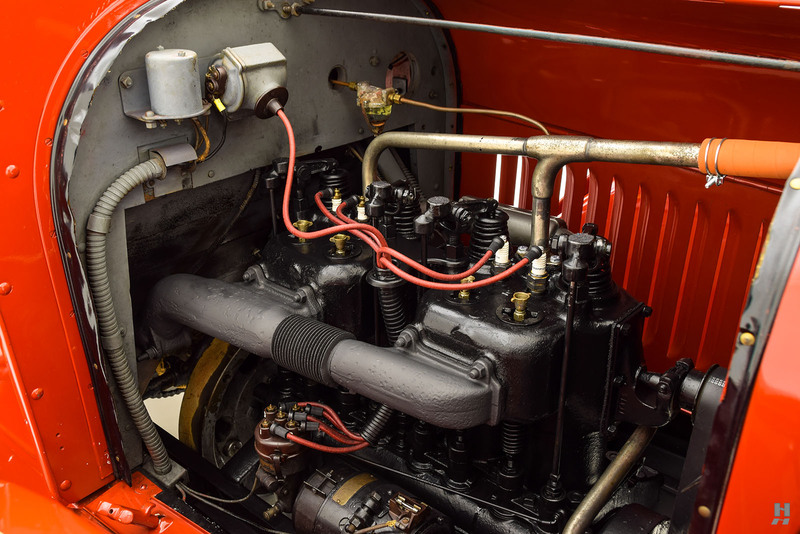 The was met with protests by his former colleagues, so he changed it to REO Motor Car Company, and continued his focus on low cost, conventional cars. 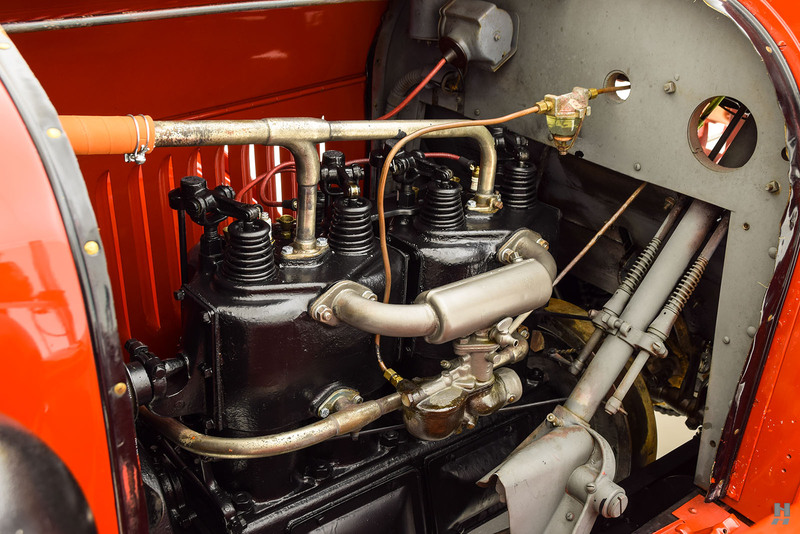 REO soon developed a reputation for dependable, powerful engines and solid construction. 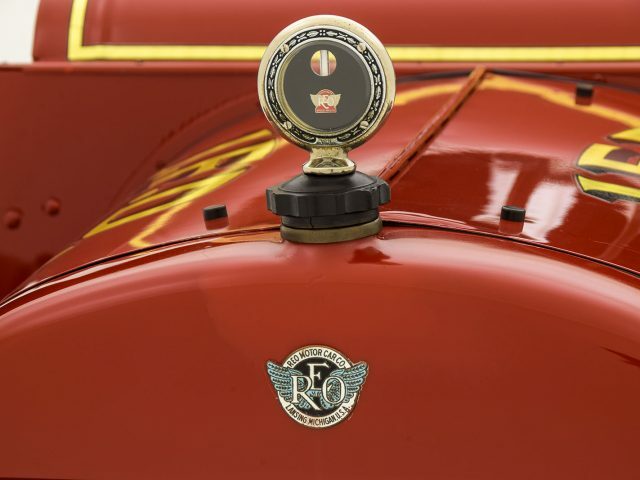 The company branched into the medium-sized truck market, with the REO Motor Truck Company incorporated in 1910. 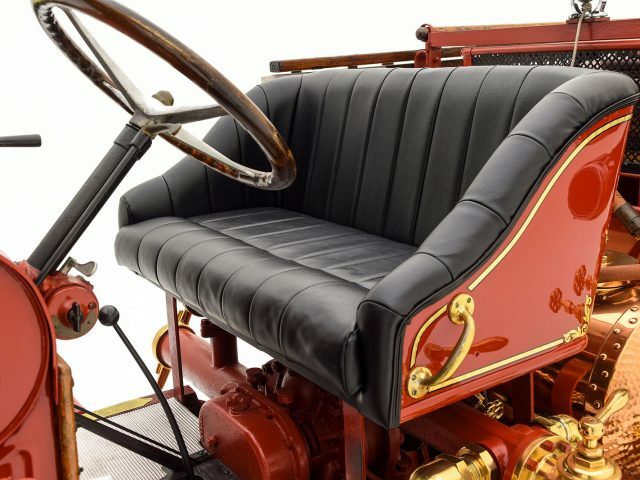 The popular mid-sized Speed Wagon model (“Speedwagon” after 1930), featured powerful engines and a superior top speed compared to the competition. 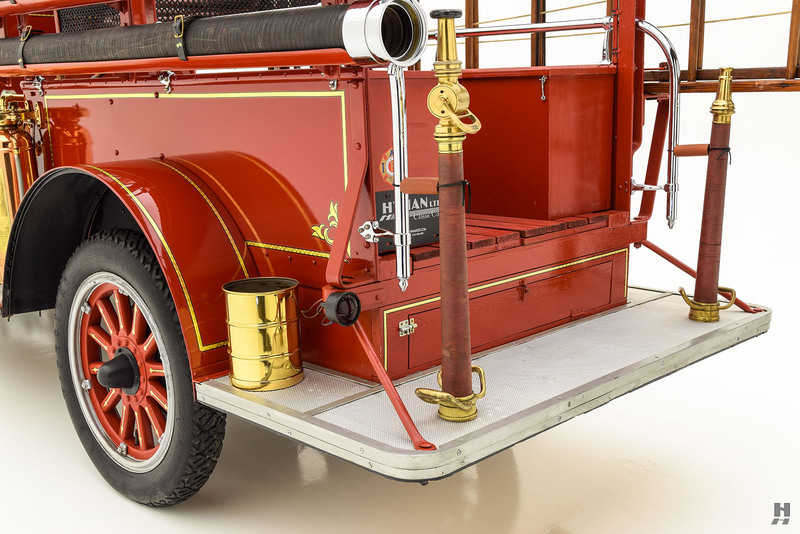 The Speed Wagon line consisted of several different models ranging from a ¾-ton through 2 ½-ton. 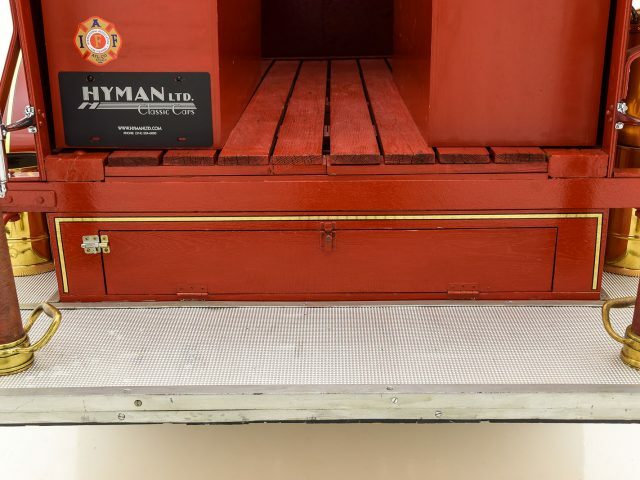 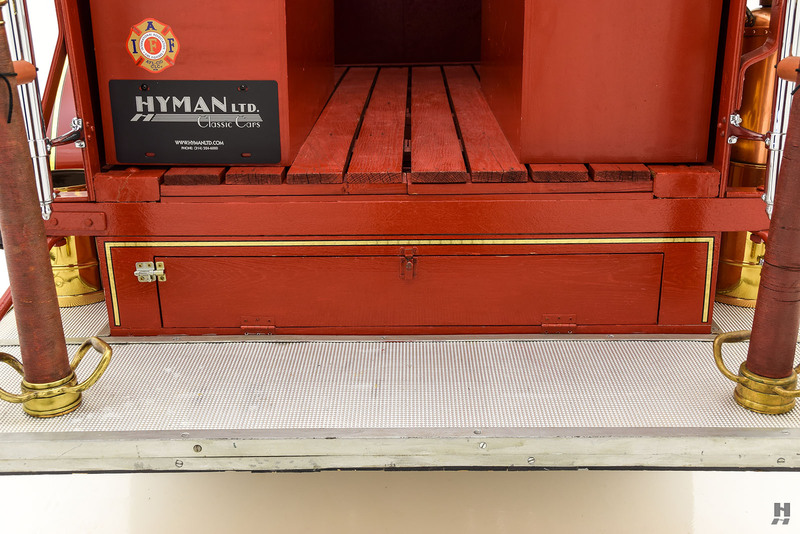 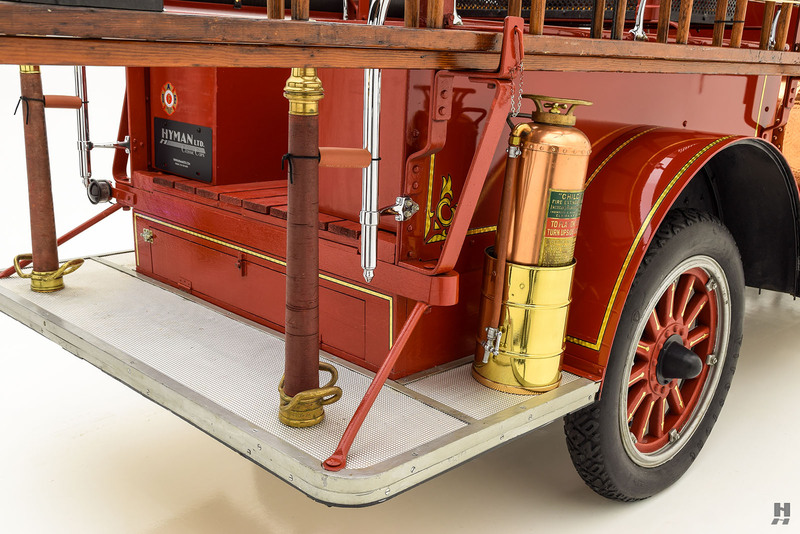 Outside firms adapted the chassis to create dump trucks, ambulances, delivery vans, fire engines and virtually any commercial vehicle imaginable. 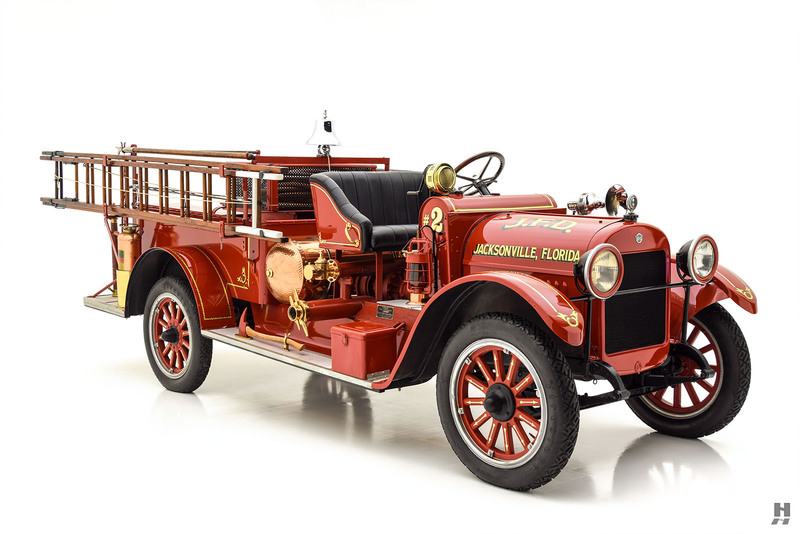 Contracts with the U.S. Military meant strong production numbers throughout World War I, with trucks often outselling cars on an annual basis. 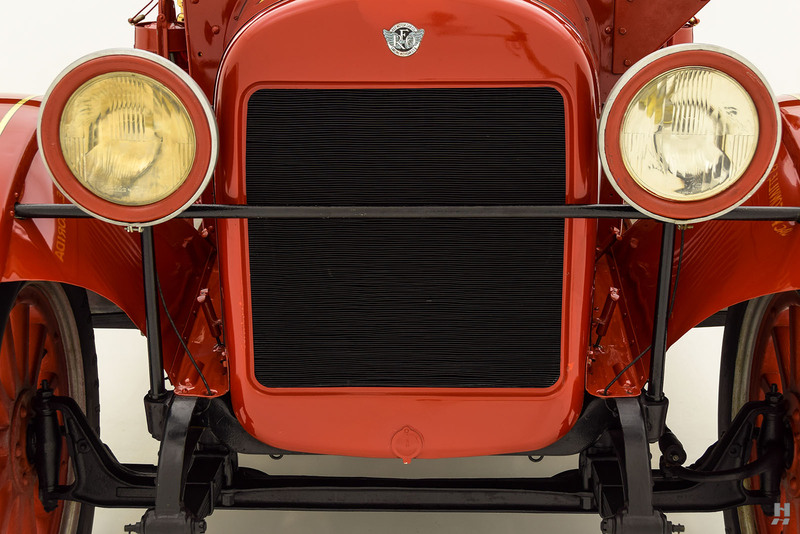 As automobile production faltered in the 1930s, REO truck production remained strong. 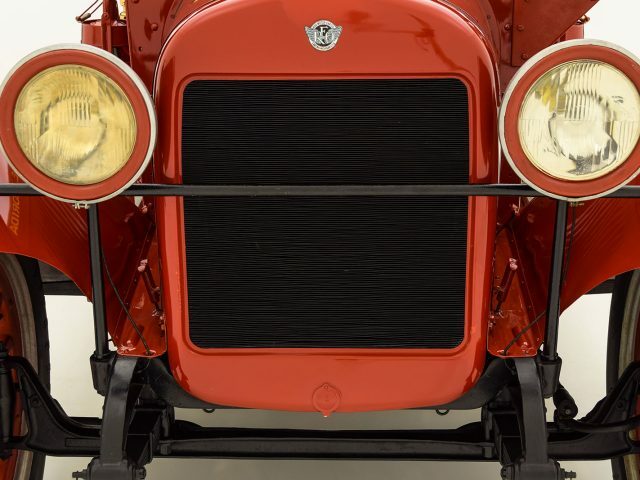 The automotive division folded in 1936, however, trucks continued through 1957 when White took over the firm. 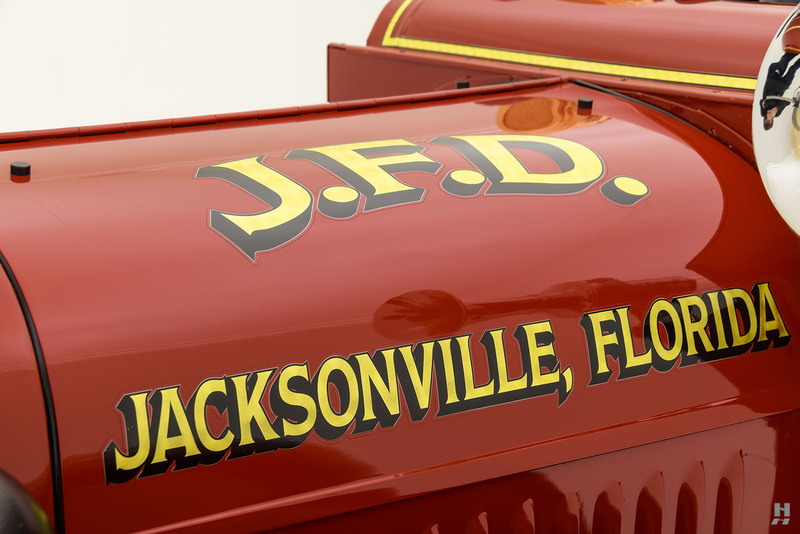 With the acquisition of Diamond T trucks, White briefly revived the name from 1967-1975 with the Diamond-REO line of extreme-duty trucks. 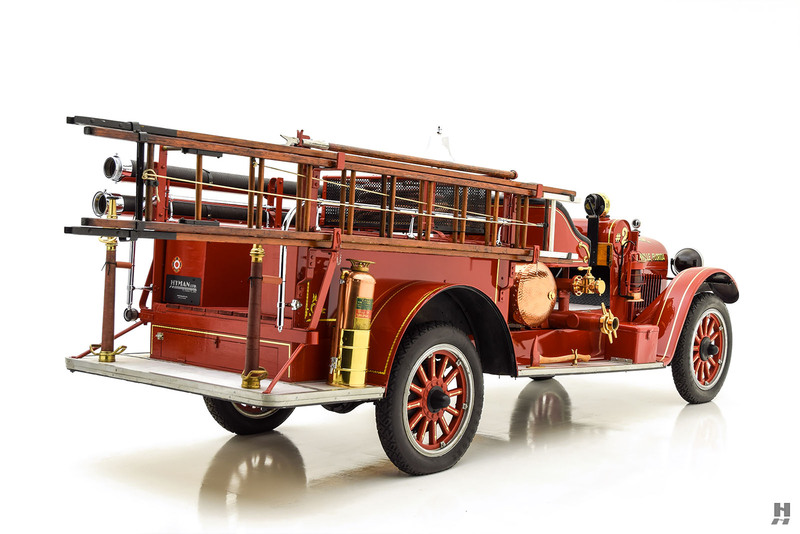 With such a reputation for toughness and performance, it is little surprise that REO trucks were popular with firefighters. 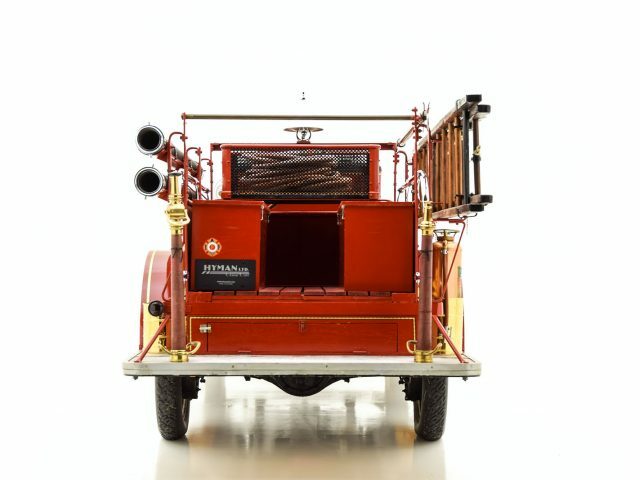 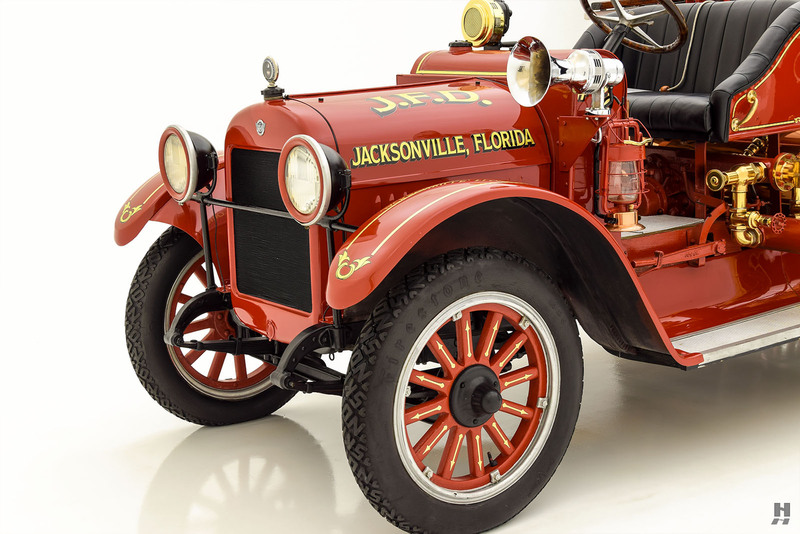 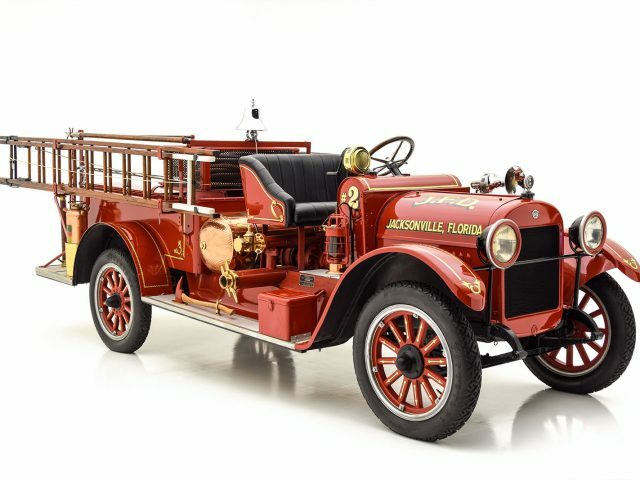 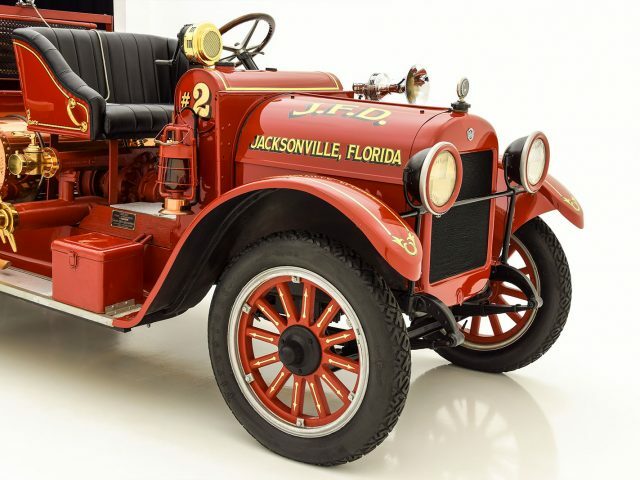 This 1925 REO Speed Wagon with Foamite-Childs Triple-Combination apparatus is a fantastic example of the type of medium-duty fire engine that was popular with smaller towns of the period. 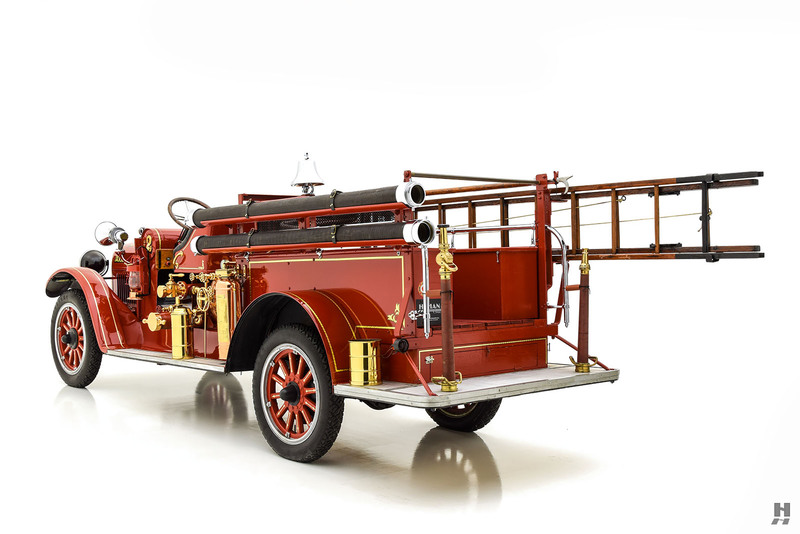 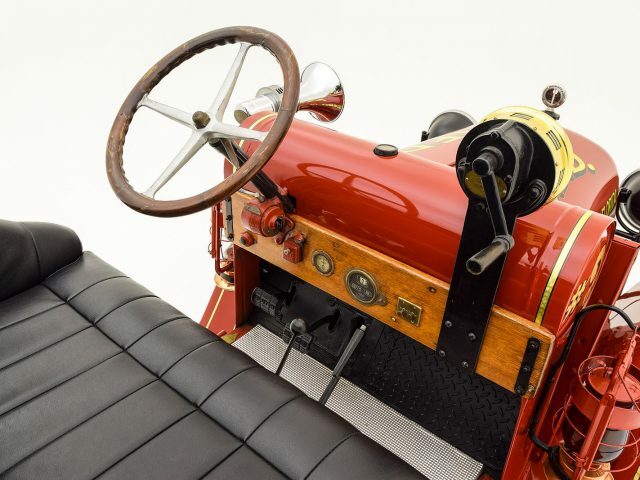 Not every city could afford a mighty, purpose-built Ahrens-Fox or American LaFrance, so companies like Foamite-Childs of Utica, New York filled the gap with equipment built to be easily adapted to existing, commercially available truck chassis. 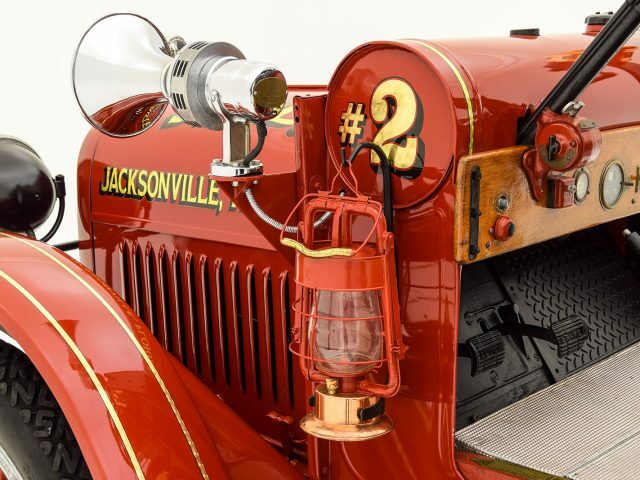 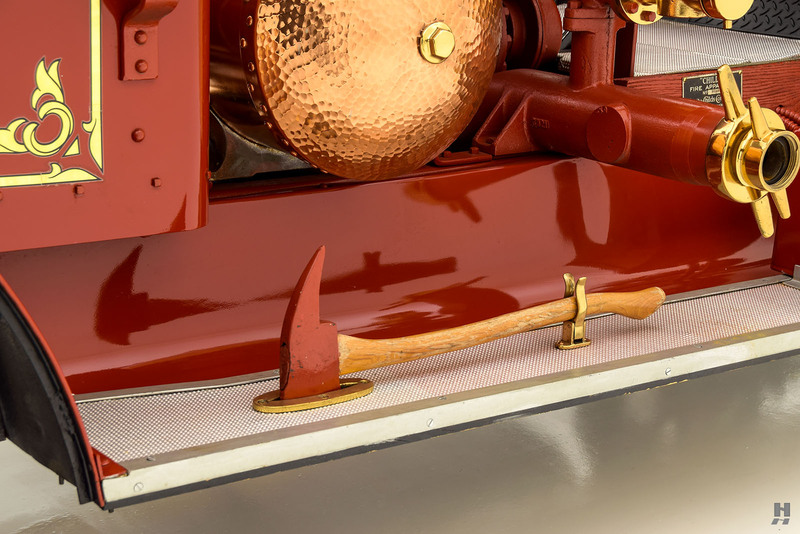 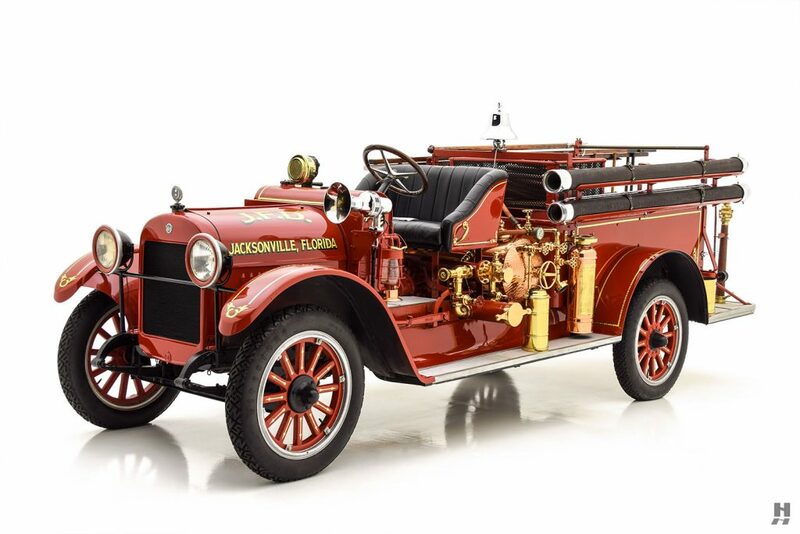 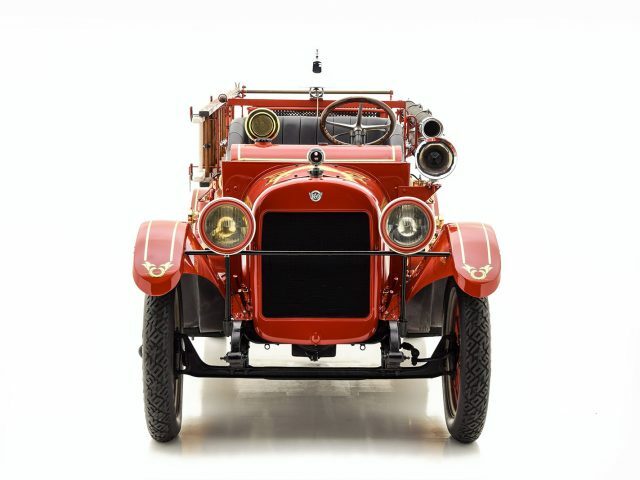 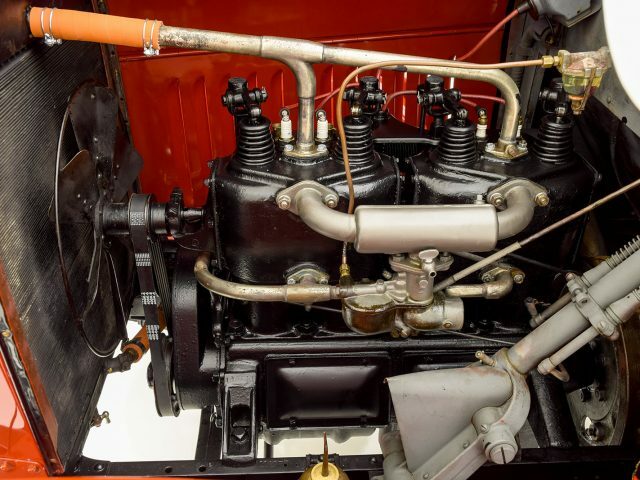 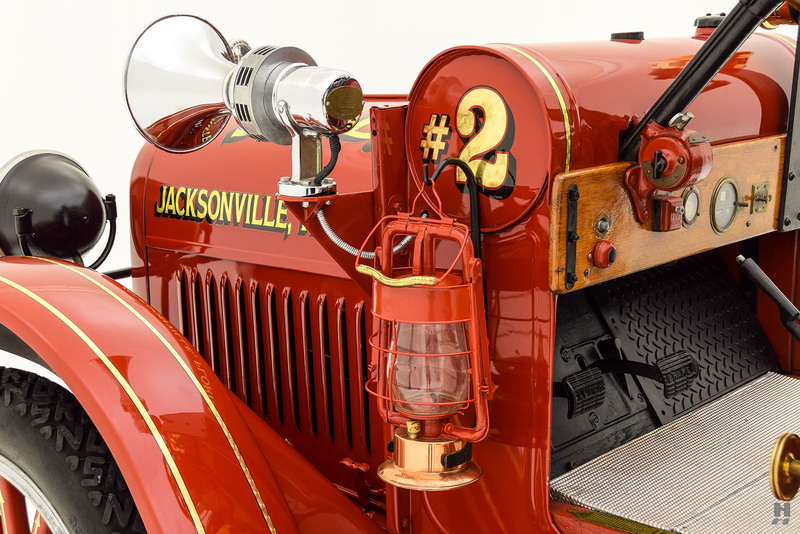 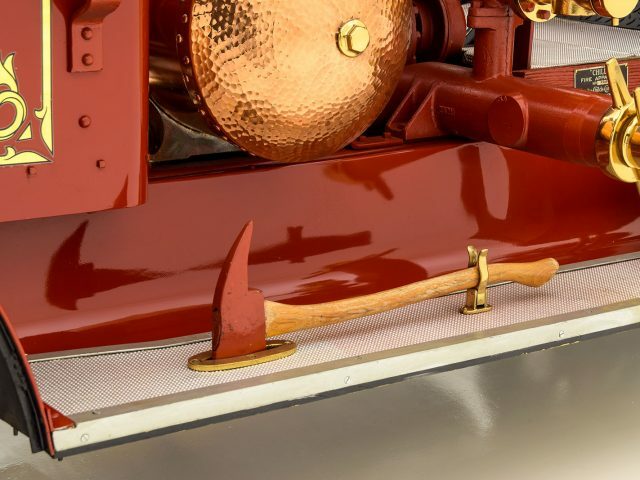 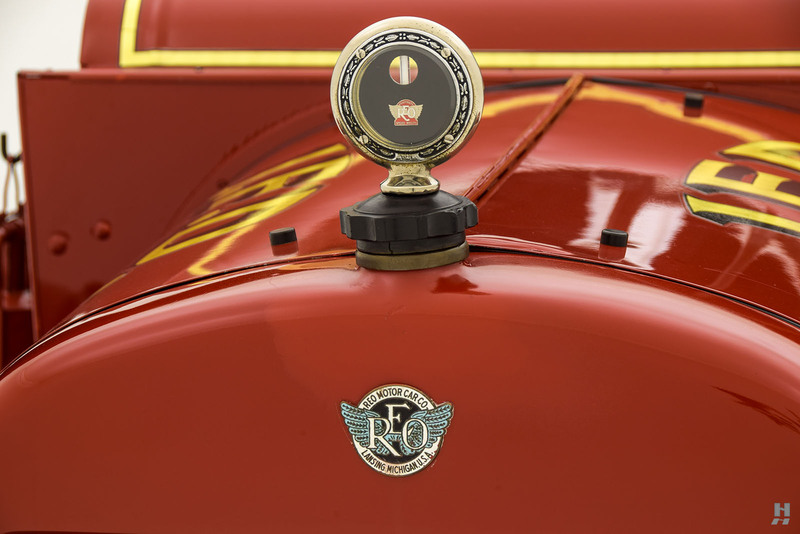 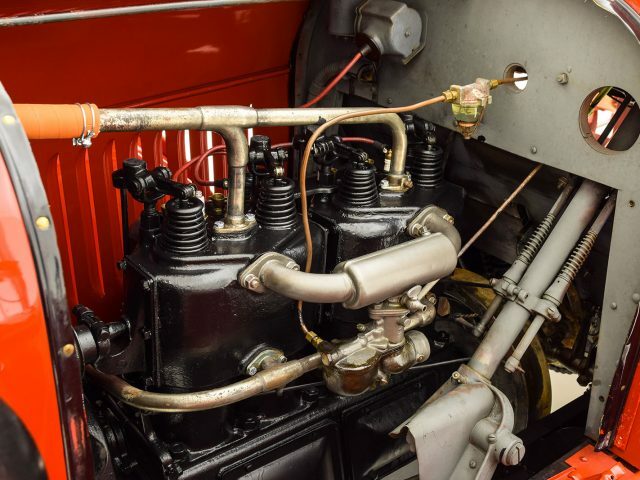 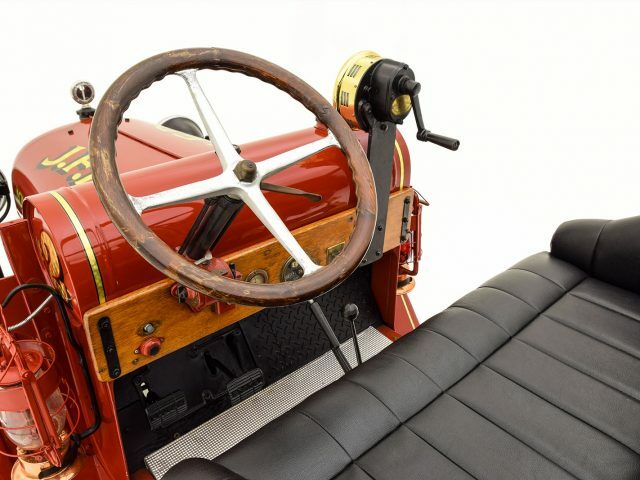 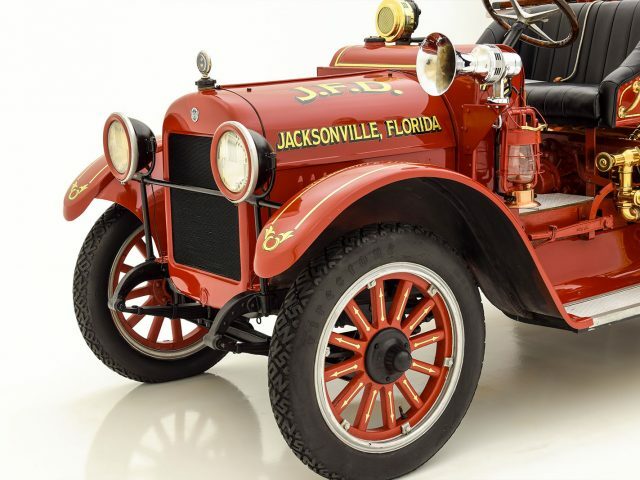 Equipped with a triple-combination arrangement, this REO would have likely been a hard-working small-town fire engine. 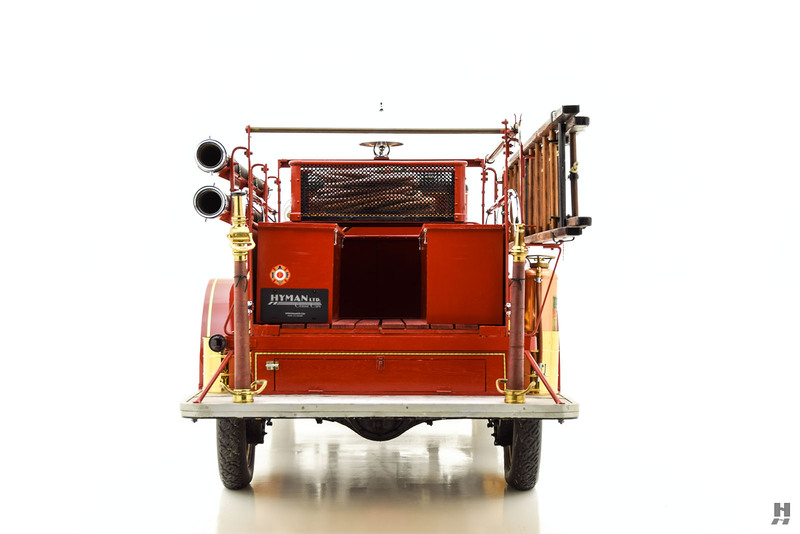 It offered three trucks in one: A hose cart, water pump, and chemical tank built on a single compact chassis. 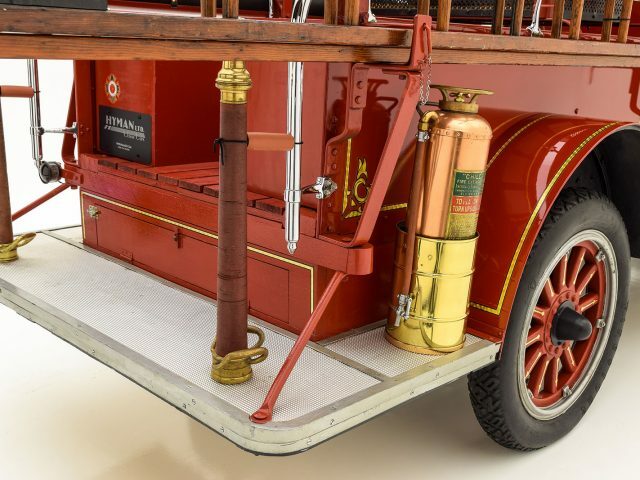 This delightful example retains much of its original equipment, including the copper chemical tank with canisters for the sodium bicarbonate charge, Dietz King Lanterns, period-correct ladders, and a Childs extinguisher. 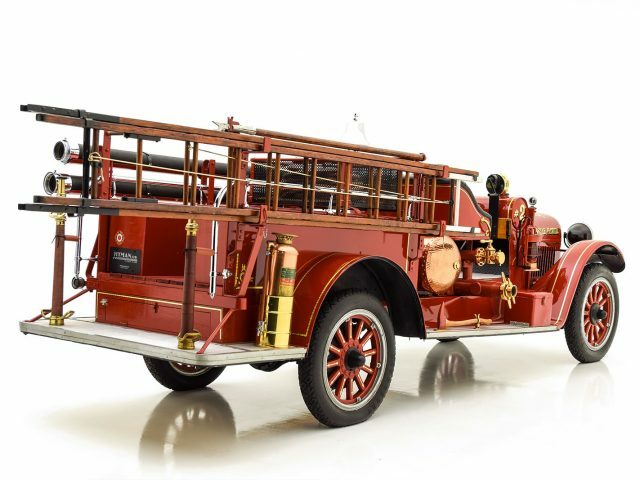 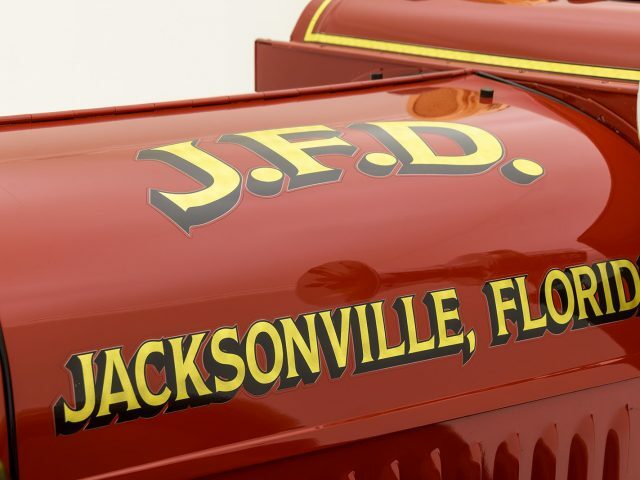 This truck is ideally sized for an enthusiast considering their first fire engine, as well as the experienced collector wanting a compact fire truck that can be enjoyed readily on the road. 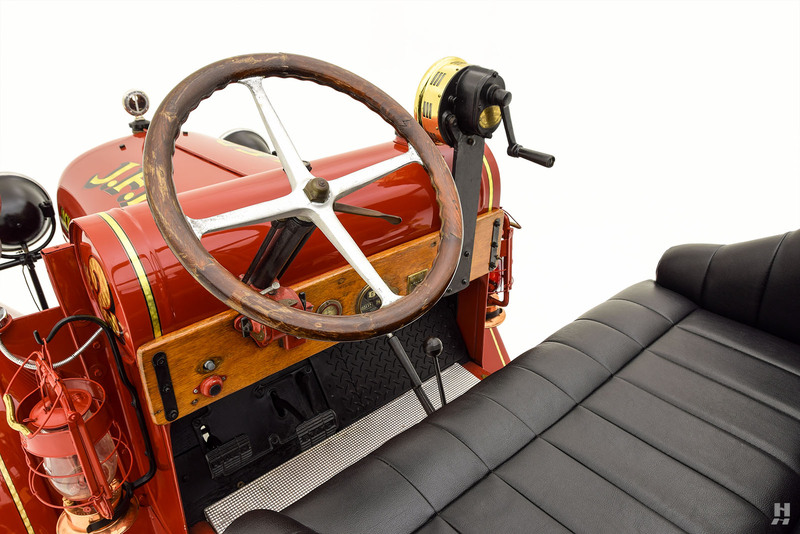 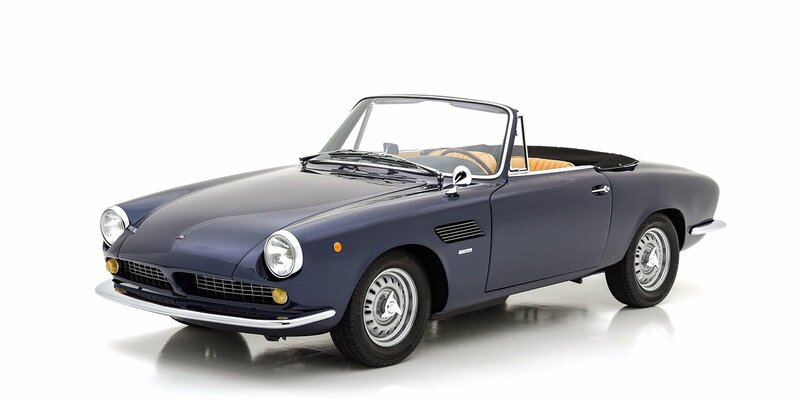 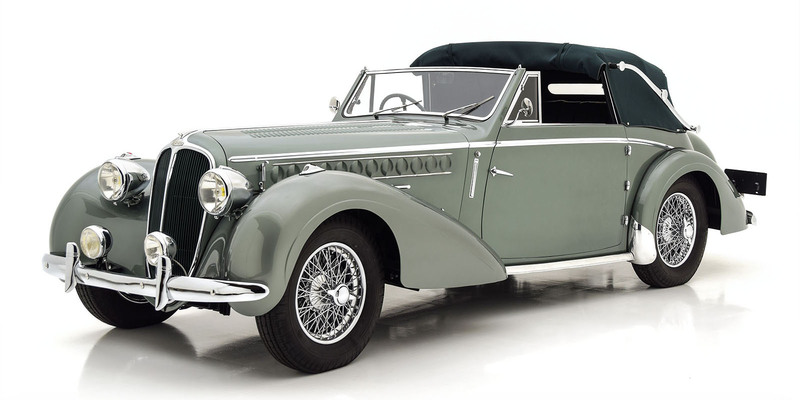 It presents in very good overall condition, with an honest appeal and well-maintained patina. 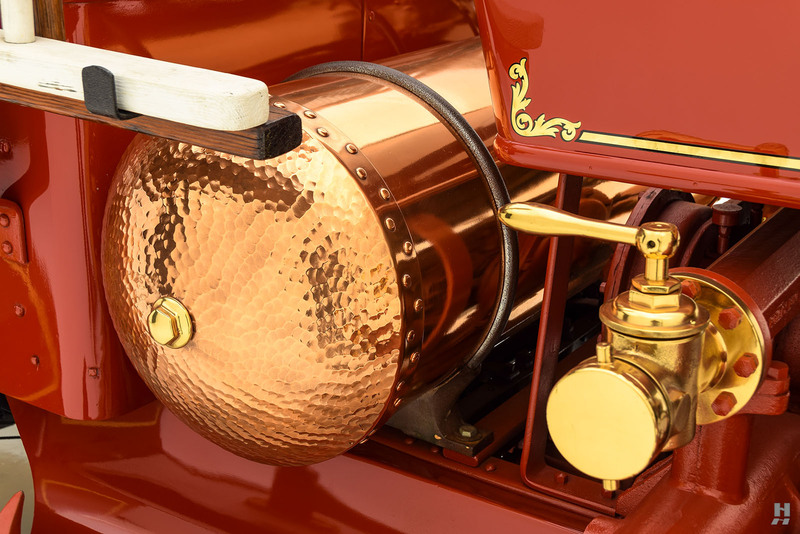 The body is in very condition, with pleasing paintwork and extensive, highly-polished copper and brass fittings. 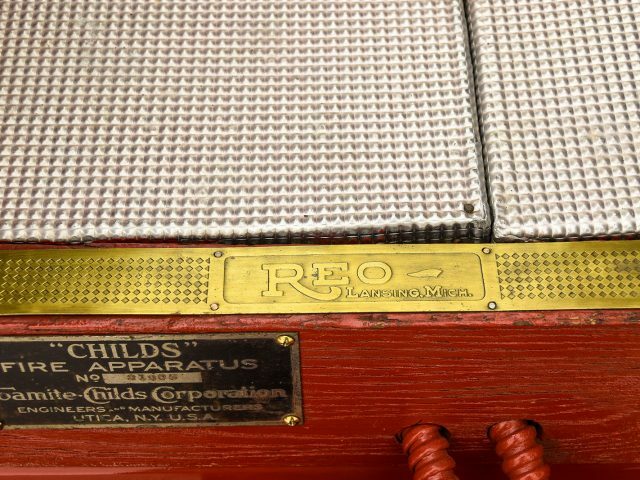 The powerful REO T-Head inline-four runs exceptionally well, with more than enough grunt to make easy work of the relatively lightweight body. 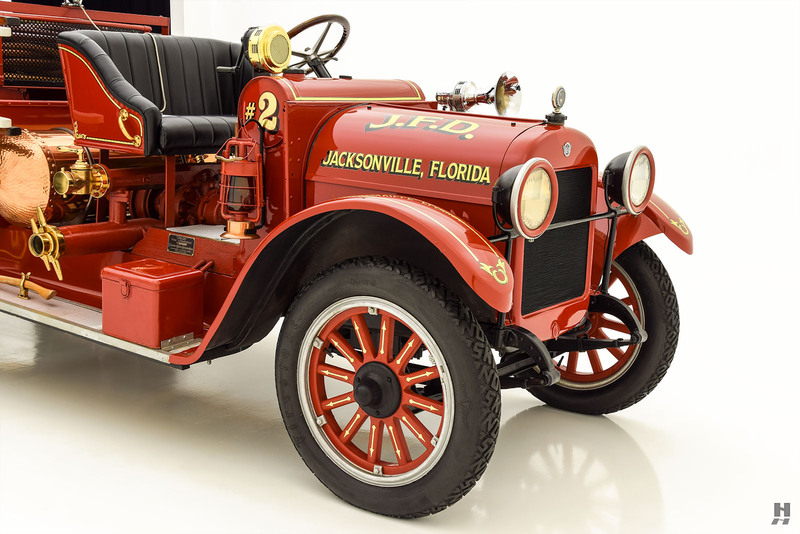 REO would have been a popular choice for fire companies of the day, given their performance and dependable nature. 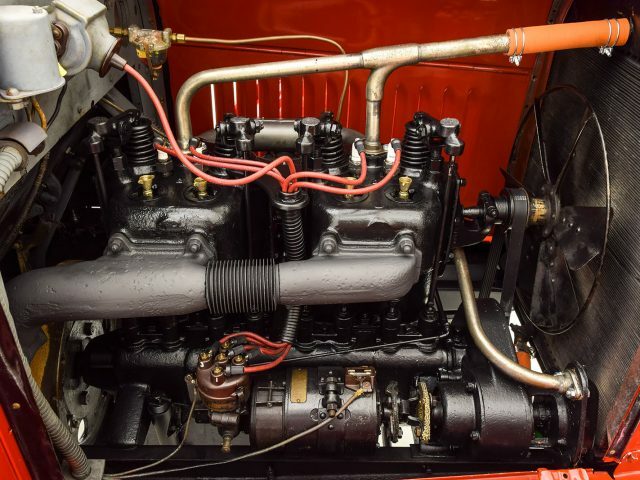 This example drives quite well, with surprising pep from the T-head engine and respectable road manners. 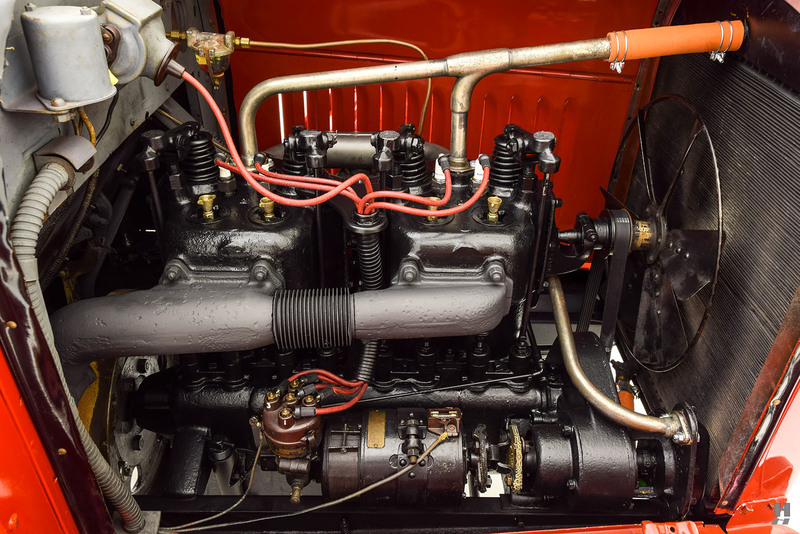 The engine is honest and unfussy, with black painted cylinder blocks, and tidy cosmetic presentation. 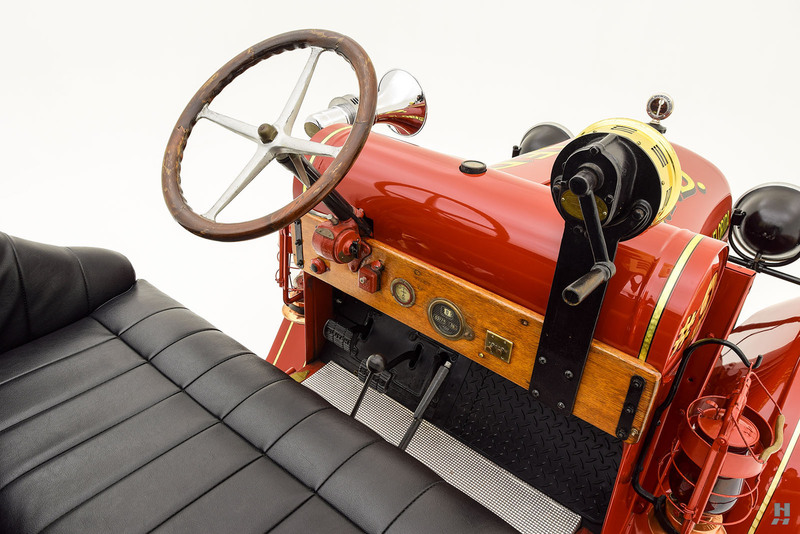 Behind the engine and 3-speed sliding gearbox sits a Northern Rotary Pump, mounted below the seat and ahead of the copper chemical tank. 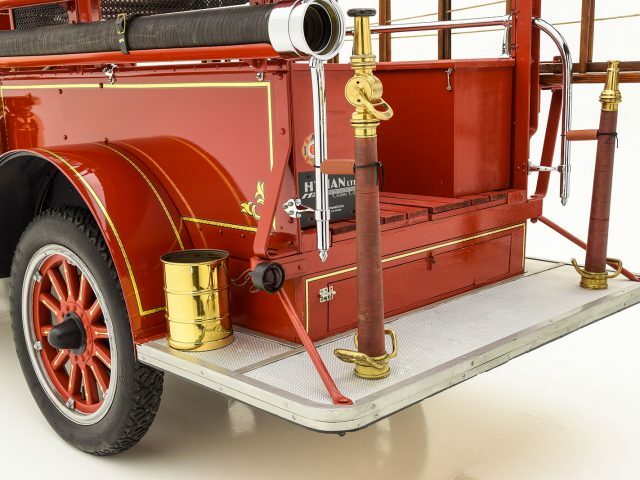 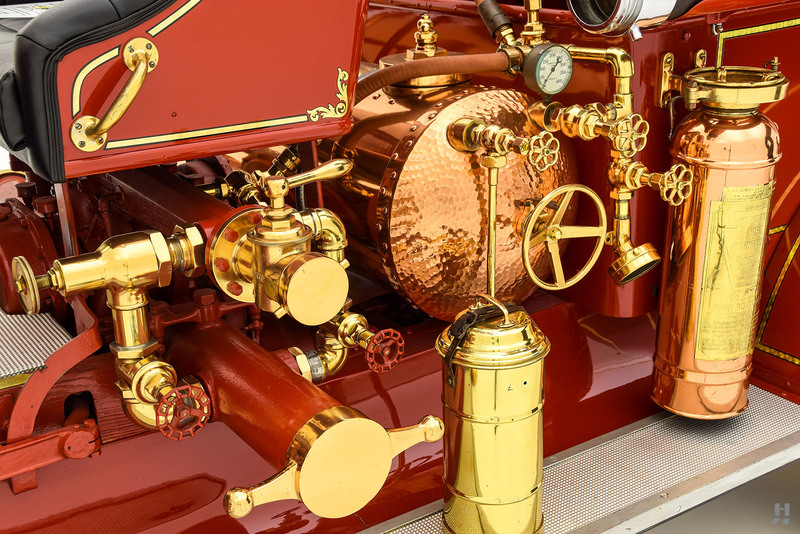 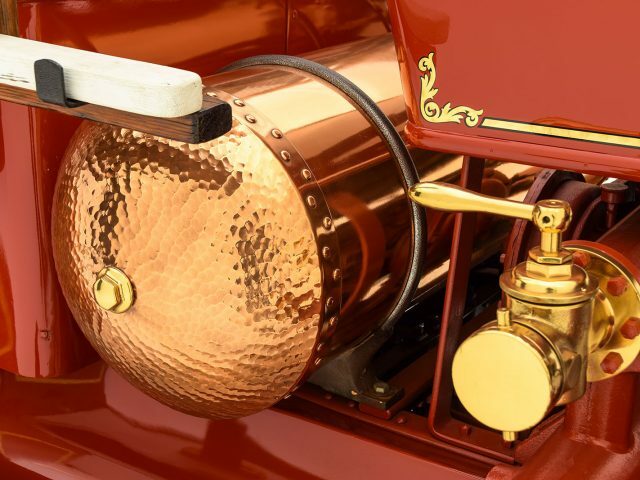 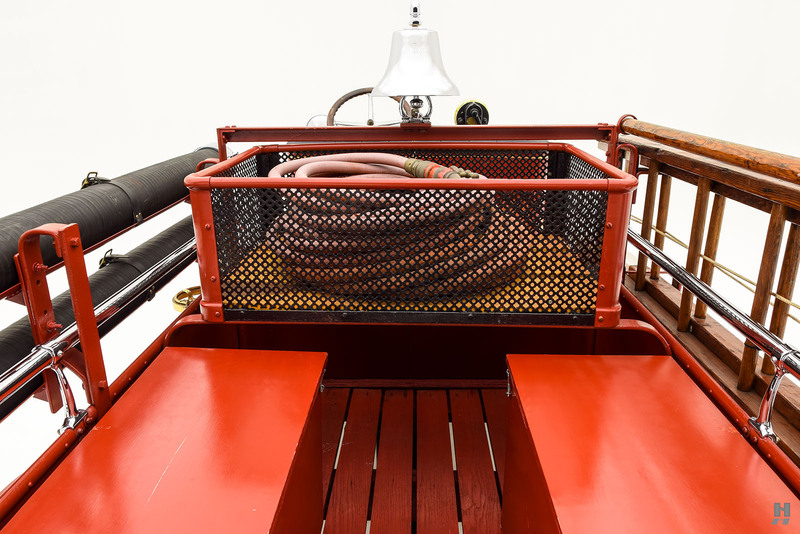 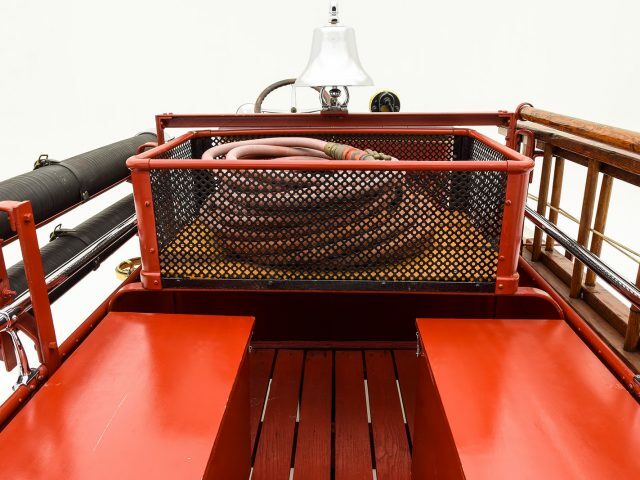 Well-appointed with numerous period-correct accessories and fittings, this REO/Childs Triple-Combination is a delightful and highly enjoyable piece of antique fire apparatus history. 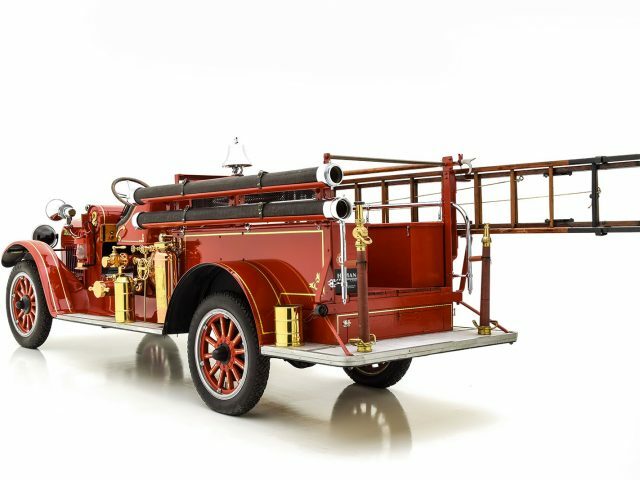 It’s relatively compact size and strong-running nature make it well-suited for use in shows, parades, and musters.